Right before New Yearâ€™s, I took a trip to the new Academy in town to see what was in stock and hopefully pick up some ammo, and perhaps a weapon or two if the price was right. As I scanned the empty racks where AR type rifles would normally be, the sales manager walked up and mentioned that those rifles disappear as fast as they arrive but then followed it up with â€œyou want to see something cool?â€. Any time those words are mentioned in a gun store you have to say yes and what’s the cool item of the day? It was the Ruger 10/22 Takedown model. This is Rugerâ€™s newest version of their 10/22 line of .22 caliber rimfire rifles, and since the 10/22 line was introduced in 1964, more than 5 million have been produced. In talking with gun owners, it seems like everyone either owns one, or knows someone who has at some point in their lives. I owned an old 10/22 as a teenager and had more fun that I can tell you here driving/riding around the back roads of East Texas and practicing with it. The 10/22 frequently makes the list of â€œfirearms you must ownâ€ soÂ I’veÂ been meaning to get one for years but never made a big effort at it. As luck would have it, enter the 10/22 Takedown. In regards to features and ergonomics, this is where this the 10/22 Takedown separates itself from the pack – literally, as the Ruger 10/22 Takedown gets its name from being able to break the rifle down for storage. The rifle has a nice, balanced feel to it. Thereâ€™s a solid click when you lock the parts together, and thereâ€™s no play even though it consists of two separate pieces. Itâ€™s really well-built as you would expect from a Ruger. It comes with the Ruger 10/22 gold bead front and flip up rear sights and also comes with a rail mount for a scope. The rail is not installed on the rifle out of the box, you can choose to install it later using the screws provided. Putting the 10/22 together and disassembling it takes a matter of seconds. 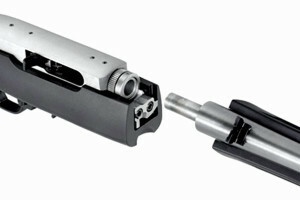 There is a lever in the fore end, just ahead of where the barrel and receiver meet. You pull the bolt back and lock it for both assembly and disassembly. To put it together, you insert the barrel into the ring on the receiver (which can be tightened or lessened to improve the fit of the two components) and turn the barrel assembly a quarter-turn clockwise until it locks. To disassemble it, you push the lever up and turn the barrel assembly a quarter-turn counterclockwise and slide the barrel out. Note: the clockwise or counterclockwise references are with lever and trigger guard facing you. The ability to remove the barrel from the receiver decreases the effort needed to clean it and itâ€™s easier than the standard 10/22 in that regard since you can insert cleaning rods down the back of the barrel and clean it back to front. Removing the barrel also helps make the bolt is easier to access and clean. It also comes with a Backpack-Style nylon bag with the Ruger logo on the front. Itâ€™s a well-designed bag and it has more capabilities than just holding the rifle. Thereâ€˜s a top pocket which is the perfect size for a small pistol like the Glock 26/27 and an extra mag or two (my Gen 4 Glock 21 with the Inforce APL mounted even fits in there!) or some extra mags for the rifle, and in the lower pocket there are pouches designed to keep the magazines separate from each other. I was able to get a couple of 25 round Butler Creek Magazines and a couple 50 round boxes of ammo in there with no trouble. Inside the bag there are three pockets, a large one on the left side and two smaller ones on the right. You can put the receiver in the left side pocket and the barrel in one of the right side pockets or the receiver and barrel in the right side pockets and use the left side for other items. Each pocket has a hook and loop flap to keep items in place. The bagâ€™s great for having everything you need packed on one place so you can grab it by the carrying handle or use the sling and head out to where ever you like to shoot. The trigger of the 10/22 TakedownÂ isn’tÂ match grade, but works just fine.Â I’veÂ put about 500 rounds through it so far andÂ I’veÂ found it to be very accurate and a blast to shoot. I can shoot tight groups with it at extended ranges (50 yds +) no problem just standing. In other words, itâ€™s your typical Ruger 10/22. This is the first gun my son will learn to shoot with when he gets old enough and I know heâ€™ll enjoy it even more than I do. There isnâ€™t much you have to do with a Ruger 10/22 out of the box. Buy some ammo, load it up and fire away. Some nice additions are a good scope, a sling, and some 25 round mags, but those are all â€œnice to havesâ€ and not necessities in my opinion. They would simply help make a fun rifle even more fun. Personally, I bought 10 of the 25 round Butler Creek magazines, but havenâ€™t invested in a scope or sling yet. The MSRP of $399 will be a turn-off from some people (I paid $329 for mine) but IÂ couldn’tÂ be happier about my trip to Academy that day and the 10/22 Takedown that made it home with me. I love mine more and more. How are those butler creek magazines working out? Be sure to get the magazines with metal feed lips. They actually have an ejector built in and are far more reliable. The plastic feed lips are pretty fragile and lack the ejector. I put Volquartsen match components in mine the day I got it, and it outshoots my brother’s Kimber barreled Match 10/22. Something to be said for that. Great review, I picked one up last year and absolutely love it. Fortunately I was able to stock up on some BX-25 mags before the panic. Did you have any issues with the Butler Creek mags? The 10/22 is hands down the best auto loading .22 LR rifle IMO. Nice review, might have to look into the take down model. Thanks for the comments! Yes, the Butler Creek mags are working out well so far. When I was researching them, there were a lot of negative feedback about the plastic feed lips ones and they seem to be the ones that are most likely to have feed problems. I got the metal feed lips and no complaints. Random misfeeds, but rare to this point and I’ll see if that continues as they get used more and more. I would have preferred the BX-25 mags made by Ruger, but between the availability issues and price drop, it just wasn’t worth it right now. That being said, I will definitely be getting some of those once things finally calm down. Shopruger.com does have the BX-25’s available to backorder, I picked up a few the other day for my takedown also. I spoke to them on the phone and they said 6 – 8 weeks for delivery in case you wanted to check it out.